Cubital Tunnel Syndrome Handout | Dr. Thomas Trumble, M.D. The word “cubital” is Latin for “elbow” and cubital tunnel syndrome is a compression of the ulnar nerve at the level of the elbow. This produces numbness and tingling, particularly in the ring and small finger. The ulnar nerve provides strength to the small muscles within the hand allowing the fingers to move apart (abduct) or come back together (adduct). It also provides a key supply to the muscles powering the thumb for pinch. Therefore pinch strength can be weak or awkward when the ulnar nerve has significant compression. As noted above, the symptoms of cubital tunnel are frequent numbness and tingling in the ring and small finger, particularly with the elbow flexed. This can be worse at night and is occasionally relieved with shaking of the elbow or trying to straighten the elbow. The ulnar nerve travels through very tight tunnel at the level of the wrist (Figure 1). This figure demonstrates the normal path of the nerve in the dotted line and in the path of the nerve following a surgical transposition to help relieve symptoms. 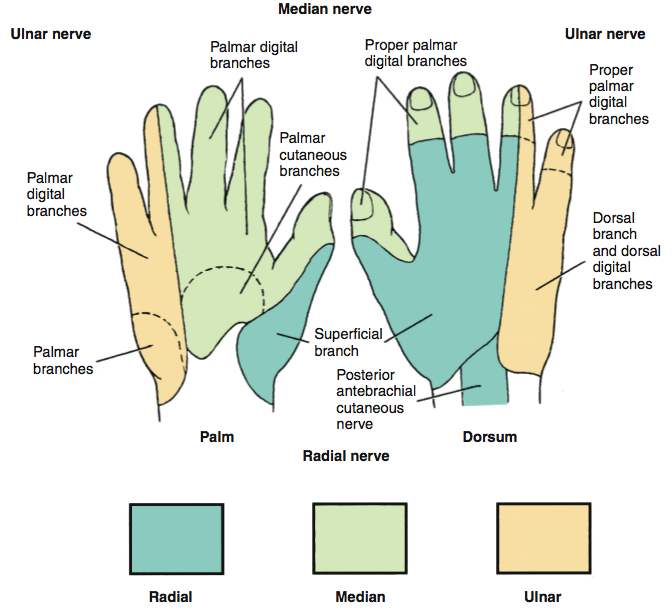 The ulnar nerve supplies the sensation to the small finger and half of the ring finger that is adjacent to the small finger (Figure 2). 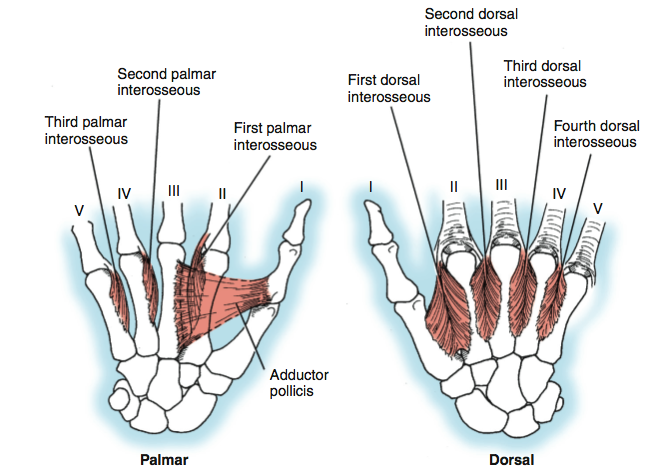 This produces a pattern of numbness that extends from the fingers into the palm (Figure 3). 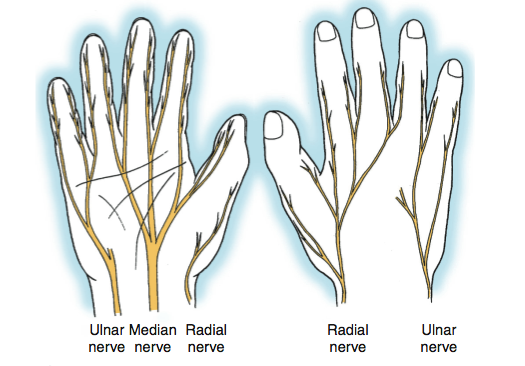 The ulnar nerve supplies the intrinsic muscles, which are the fine muscles within the hand (Figure 4). These are the muscles responsible for abduction (spreading the fingers apart) and adduction (bringing the fingers back together). They also control how the fingers curve during gripping activities. Who has Cubital Tunnel Syndrome? Cubital tunnel syndrome can occur in individuals of all ages. There is no particular disease or condition associated with cubital tunnel syndrome. It can affect both the dominant arm and the non-dominant arm. There is an increased incidence in people who have had prior trauma that resulted in instability of the elbow. If the elbow can shift from side-to-side, it puts extra stress on the nerve where it travels through the tunnel. How do we diagnose Cubital Tunnel Syndrome? The patient’s history of numbness and tingling of the small and ring finger is a key factor. This is particularly evident when the elbow is flexed (such as when holding a cell phone or hair dryer for a prolonged period of time). It is important to differentiate this from other conditions at the level of the neck or a pinched nerve at the level of the wrist. One of the main ways to help differentiate the site of nerve irritation is an electrodiagnostic test (EMG/NCV). This test uses small amounts of electrical stimulation to map out the ability of the nerve to conduct (that is, for the nerve impulse to travel along the course of the nerve). When the nerve is compressed, there is decreased blood supply, which causes the nerve to conduct much slower. This test helps identify the site of compression and also the severity of the compression. How do we treat Cubital Tunnel Syndrome? It is difficult to relieve the symptoms of cubital tunnel syndrome without surgery. Occasionally in the early stages of the condition, night splints, which help maintain the elbow in a straight position. These are often difficult to wear when sleeping; sometimes a soft type of brace supporting the arm and preventing the elbow from flexing can be helpful in relieving the symptoms. In more severe cases, particularly when the muscles are affected, surgery is recommended. If the condition is still mild enough when there is no evidence of muscle denervation then a limited procedure can be performed. This involves a fairly small incision at the level of the elbow. 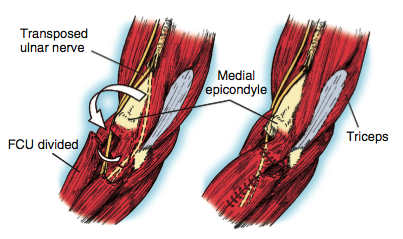 The nerve is then relieved using an endoscopic technique (Figure 5). In more advanced cases, the nerve needs to be transposed as noted in the Figure 1. Moving the nerve out of the tunnel helps to provide a new soft tissue bed for the nerve, and relieve the pressure on the nerve. After surgery, therapy is often helpful to begin early motion to decrease scar formation (beginning approximately two weeks after the surgery). For the first two weeks, the arm is braced to prevent elbow motion. At six weeks gentle strengthening exercises are performed.